Ceramic tile can make or break the look of a room. While pink tile in the bathroom was all the rage in 1960, decorators of today often opt for a more muted tone. 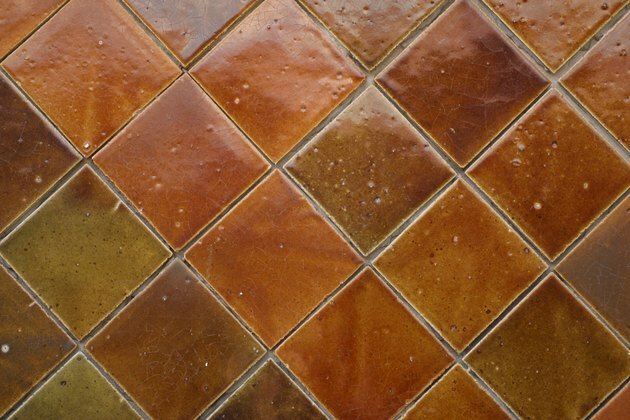 With the proper preparation you can give old tile a new look for very little money. Although the right paint will be very hard after it is dried and cured, there are some areas of your home that are bound to have future problems. Any area of tile that is consistently exposed to moisture or steam is likely to peel. Avoid painting shower stalls. Areas of floor tile that receive heavy traffic should have an area rug over them in order to avoid scratching the new surface. Kitchen counter tops and back splashes can be painted, but remember to use a cutting board whenever you work on the counter top to avoid damaging it. Take a good look at your current tile. If you have broken or cracked grout, you'll need to repair it at least 48 hours before painting day. Fill any imperfections, as this will result in a more professional looking job. Replace any missing pieces of tile. While you don't have to match the current tile exactly, choose pieces that are nearly the same color. Ask a professional at a home improvement store or use a pre-packaged tile repair kit if you're unsure of what you need to repair your tile. Preparation is the most important step in repainting ceramic tile. Use a mildly abrasive bathroom cleaner to remove all wax, oil, dirt and grease from tile. Use a small, stiff brush to remove any mold. Lightly sand the tile. Paint will adhere better to a roughed-up surface. Brush away any dust. Look at the tile surface from several different angles to ensure that none remains. Choose a high-quality epoxy- or oil-based paint, as water-based paints will peel away from ceramic surfaces. Tape off areas you don't wish to paint. Apply a very thin coat of primer and allow it to dry overnight. Apply a second coat and allow it to dry. Using the same technique of applying thin coats, paint the tile. You will find that the thinner you apply the coats, the neater the final outcome. After 48 hours, apply a thin coat of water-based urethane to seal your project.